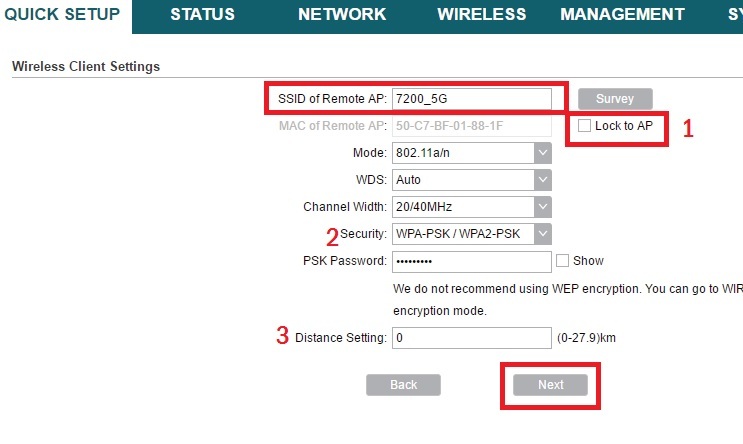 TP-Link CPE220/CPE210 and CPE510 point to point configuration in WDS bridge. 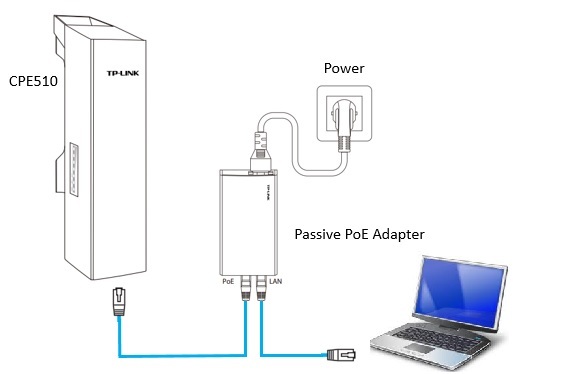 All the model support same TP-Link pharos web interface so follow the post to know TP-Link CPE510 Outdoor Device Point to Point configuration. TP-Link CPE510 300Mbps outdoor wireless device for point to point bridge to connect two different location wirelessly. TP-Lin CPE510 having a variant with 2.4GHz band model is CPE210 for Wi-Fi and Wireless CPE purpose. The earlier post about CPE210 Access Point configuration and CPE210 Repeater mode Configuration already done. 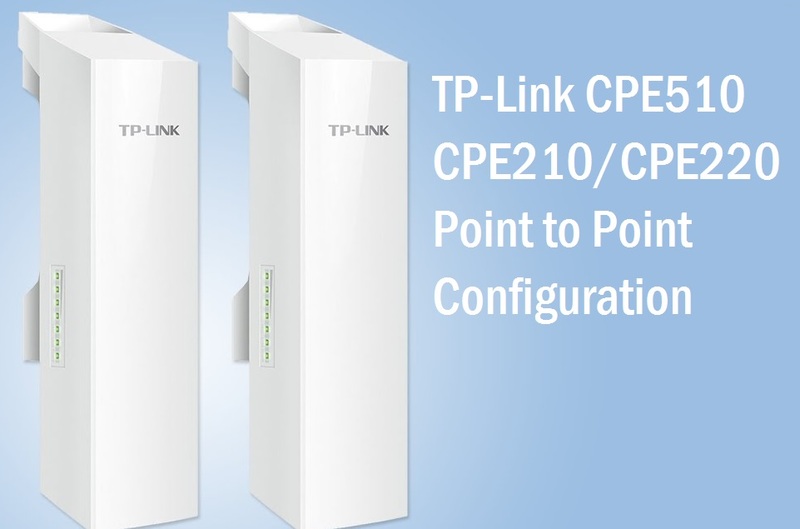 As the TPLink CPE510 and CPE210, both are same pharos series software so this configuration also works for TP-Link CPE510 Outdoor Device Point to Point and CPE210 configuration. TP-Link CPE510 300Mbps wireless Outdoor device best for a distance 2KM to 3Km point to point connectivity for internet and CCTV purpose. If you are looking to connect your two different locations wirelessly than CPE510 can be the suitable outdoor device for you. The best thing about CPE510 and CPE210 is it loaded with TP-LINK Pharos MAXtream TDMA (Time-Division-Multiple-Access) technology improves product performance in throughput, capacity and latency performance, ideal for PTMP applications. 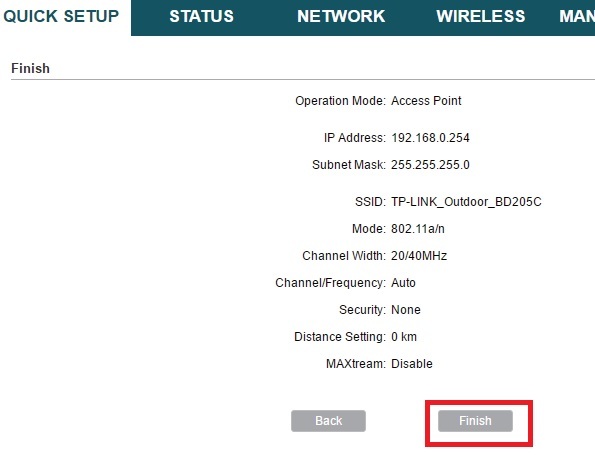 Before going to start configuration part go through basic and important key feature of TP-Link CPE510 300Mbps outdoor wireless device. TP-Link CPE510 is cost-effective PTP and PTM solution device suitable for internet as well as CCTV purpose. Hardware and software both specifications make the device best for performance and stability side. 1 Grounding Terminal: for lighting safety purpose. To configure a bridge with CPE510 required pair of the device with the same 5GHz band. To connecting two different site with bridge (Point to Point) concavity configuration will be Local site and remote site. Remote Site device will as Client mode. To configuration, any device required physical connection of the device to PC/Laptop. Open your CPE510 box and take all accessories out from the box to connect physically. 1: Take your CPe510/CPE210 in hand remove the backside cover take the cat6 patch cord and connect to Device Ethernet port. 2: Now connect the Cat6 Patch cord other ends to PoE adapter PoE ports and take on more Cat6 patch cord and connect PoE adapter LAN port to PC/Laptop LAN port. Connect PoE adapter power cable to the power socket and switch on the device. 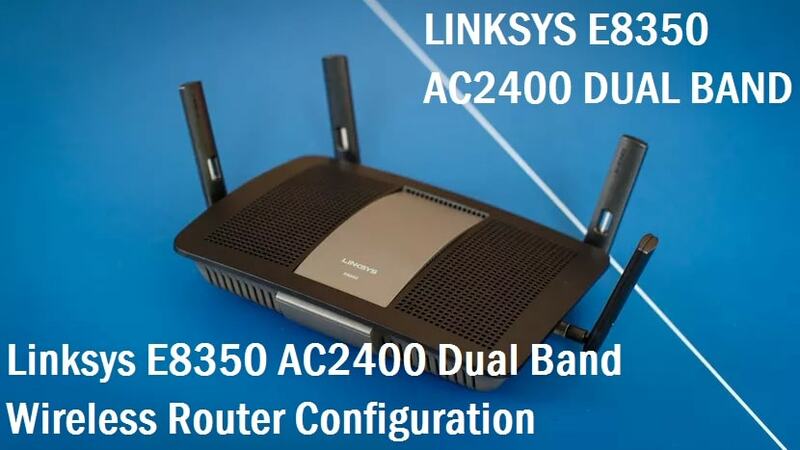 After physical connection PC/Laptop LAN IP Address should be in the same series of TP-Link CPE210/CPE510 default IP series. After the physical connection and configuration part, you can access the CPE510 device to the laptop. 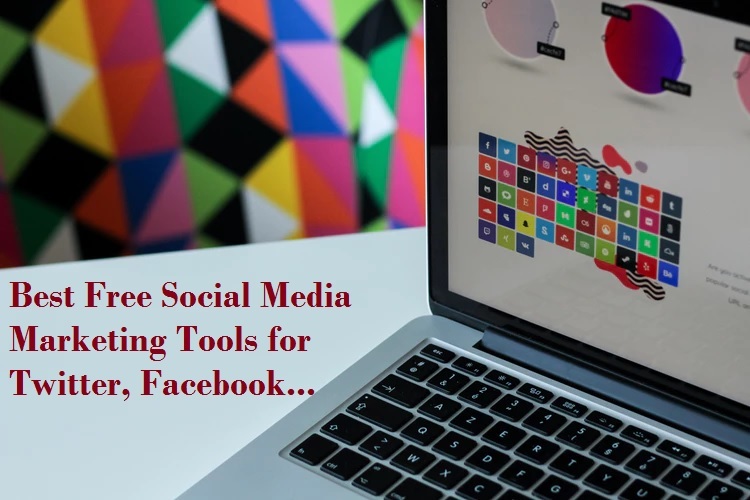 Open Internet browser such as Firefox Mozilla, Google Chrome, Internet Explorer and type TP-Link default IP in URL bar press enter button. First Login require to accept License agreement. Choose your Language from the list. 2: CheckBox to accept term and condition. 3: Click the Login button. Change the default password and username on the first login. New User Name: type the new username for your CPE510. Press the Finish button to save settings. To configuration of the point to point the first device will be used as Access Point mode. In this tutorial, I used the quick setup configuration method to create point to point bridge connectivity. The first step is to change the first device mode Access Point and click Next button. Quick setup next step is LAN settings. 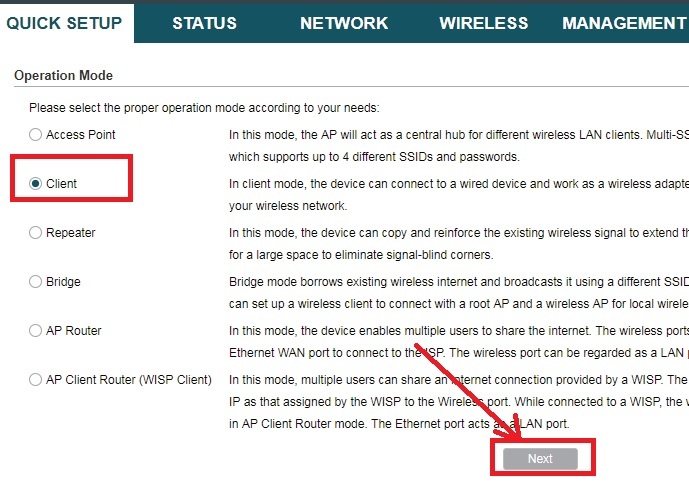 As bridge requires two devices and default IP address is same for al device. Change the default IP Address to keep protect your device from unauthorized access. Note: after the finish, the wizard device will access with new changed IP Address. 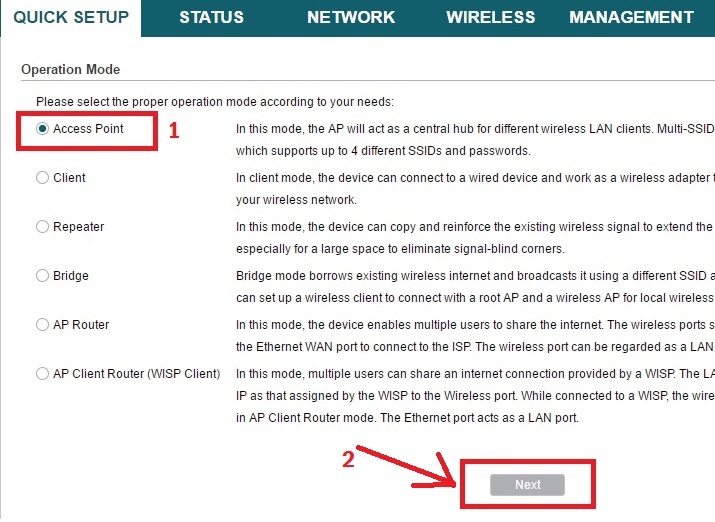 Next step to set the SSID and password to protect your wireless bridge. Channel Width- use 20/40 to auto selection as per bandwidth load. Channel/Frequency- choose the frequency as per interference and legal as per your country telecom regulatory. Distance settings – set the total air distance of your both site. Maxtream- enable the feature to increase performance. Confirm all setting configured correctly and press the finish button to save settings. Access Point device configuration finish. Now take the second device and connect same as above connection diagram follows for AP device. 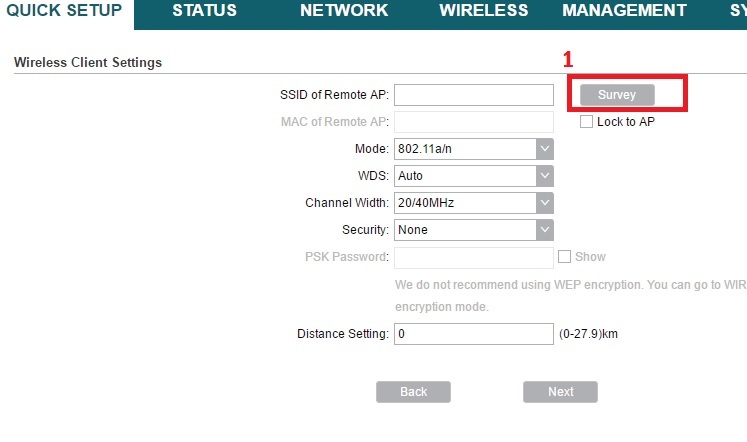 Now connect new device and login with default IP Address as followed above steps. The first step is to change the Mode to Client mode and press the next button. 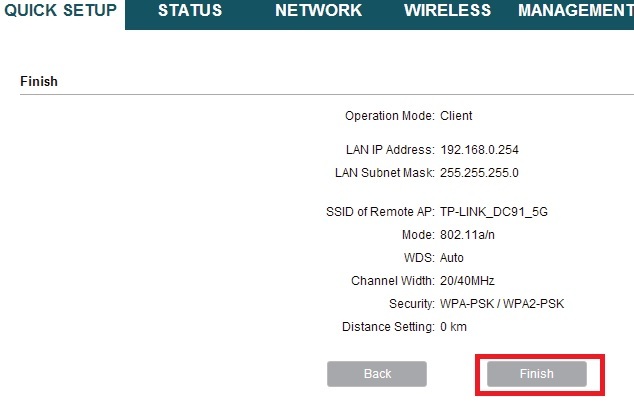 Now change the Remote device IP Address to different IP. Type IP Remote device IP Address. Now do the survey from the client device and find the Access Point device name to join the network. Find your AP device SSID name from the list. Check the box of your device name. Confirm all the wireless detail of your AP device you have chosen correct device. Distance settings: type the air distance of the point to point link. Press the next button to save settings. Check all settings and press the Finish button to apply settings. After a few second devices will reboot and you will get the AP device to ping from the client device. Your Access point device all led will glow. 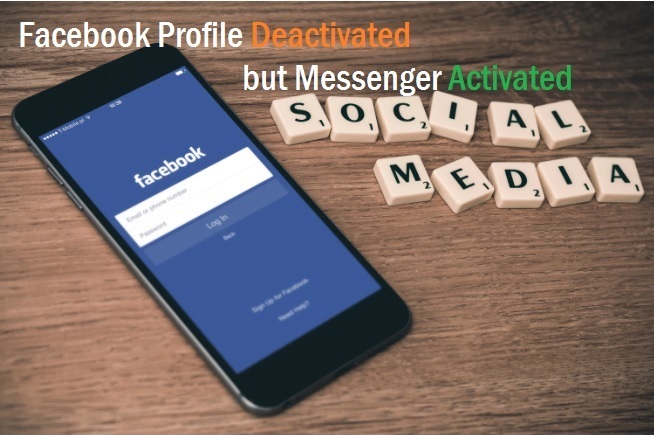 You can check connectivity signal status on status page after login the device as shown below image. Point to point connectivity is a fast way to connect two different location wirelessly without laying physical cable. TP-Link CPE510 is the best device for connecting two locations for internet or CCTV camera monitoring. 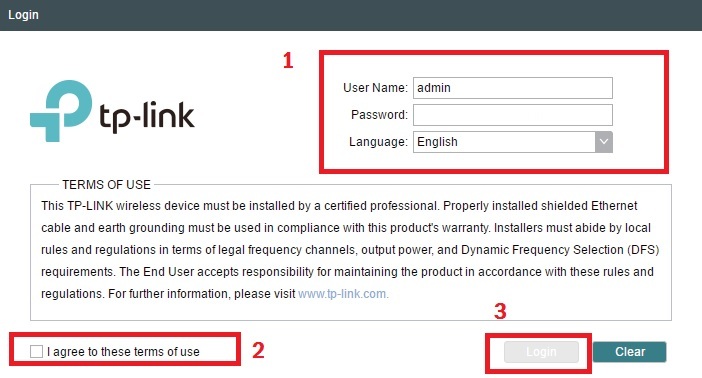 In this post, you will get an easy configuration manual to configure your TP-Link CPE510 Outdoor Device Point to Point configuration.